As a relative beginner to playing the guitar, I’m always on the lookout for ways to improve my playing skills. I take weekly lessons and I learn a great deal from my guitar teacher, but perhaps there is a way to improve myself, and perhaps even impress my teacher a bit in the process. 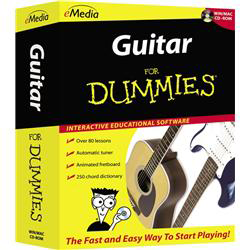 When I saw Wiley’s new Guitar for Dummies CD, I knew this was a piece of software that was right up my alley, and I wasn’t disappointed. The Guitar for Dummies CD installation is relatively beefy at over 100 MB, but it installs quickly and easily on your Mac. You do need to have the CD in your optical drive to run the application, though. The user interface is easy to navigate and the menu selections are simple to figure out. The program is well thought-out and takes you step-by-step through the process of picking up a guitar for the first time and learning to play relatively simple songs quickly and easily. The program has a great introduction, demonstrating various types of guitars, stringing your guitar, hitting frets properly, strumming techniques and using a pick. Each screen along the way is loaded with plenty of audio and video instructions. There are also a number of separate tips that explain questions that might pop up while practicing the activities on each screen. Once you’ve been instructed on the basics of using a guitar, the program gets right down to the business of teaching simple chords and songs. You have the opportunity to see a diagrams of the chords, to watch short video tutorials on how to play the chords and to play along with the instructor as you practice your new skills. There are two options for practicing your chords. One option allows you to play along with the instructor. 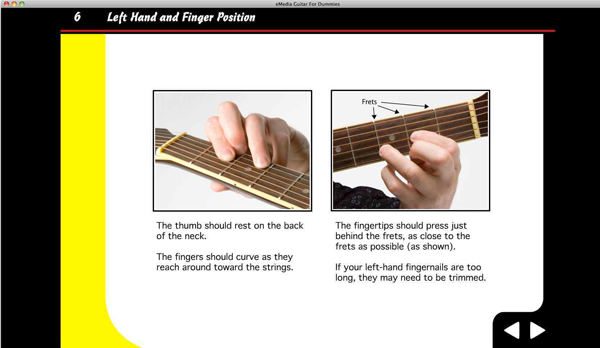 While doing so, a fretboard pops up at the top of the screen, highlighting the strings to strum and the locations to fret. I think this is a really useful feature for a beginning player. The second option allows you to switch to a MIDI version of the practice session, permitting you to speed up or slow down the speed of the practice session to accommodate your own abilities. The software tends to teach simple versions of some chords. Yes, it is much easier to play these simpler versions of commonly played chords, but they don’t sound nearly as rich and full as their slightly more advanced (and more commonly used) versions. As long as you look at it with the mindset that the software is geared toward helping new players get started with as little difficulty as possible (consider the name of the CD), the choice to use simpler chords is an acceptable decision to make. The Tools menu has some great accessories worth mentioning. Included in the menu is a customizable metronome to help you pace yourself while playing. The built-in guitar tuner is an absolute must for every player, no matter how experienced. The tuner utilizes your Mac’s built-in microphone, but you can also use an add-on microphone. A recorder allows you to make recordings your new skills and play them back later. That can really help newbies hear their mistakes they might not even be aware they’re making. 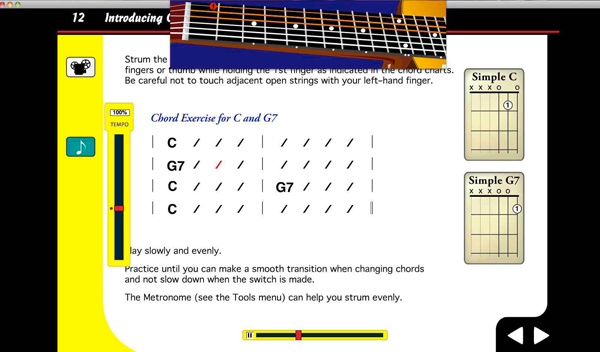 And, what guitar instruction software package would be complete without an extensive chord dictionary? It is truly extensive too, listing just about any chord you can possibly use, allowing you to listen to samples of the chord when properly played and demonstrating the proper fret positions. As you progress through the lessons, they become more and more advanced, adding more chords and other skills such as double-strumming, accented strumming, moveable power chords, and power chord riffs and muting. You also learn to play several older rock tunes such as Bob Dylan’s "Knocking On Heaven’s Door," and Willie Dixon’s/The Rolling Stone’s "Little Red Rooster." The Guns N’ Roses version of "Knocking On Heaven’s Door" is also included in the power chords lessons, but I have to say it was a riot listening to the instructor try to belt it out like Axel Rose! There are other tunes from the Grateful Dead, Rod Stewart, Creedence Clearwater Revival, Richie Valens and The Steve Miller Band too. I think this is an important addition to the package, for nothing makes a new player feel better about their playing than to be able to play songs they already like. The lessons are well thought out, and breaks are built into the software at appropriate times to allow some rest for sore fingers and hands. By the time you’ve gone through the 80+ tutorials, you have over 20 commonly used chords in your repertoire. For those of us wanting to learn more, the application offers a $20.00 coupon off the purchase of a software package for more advanced players. 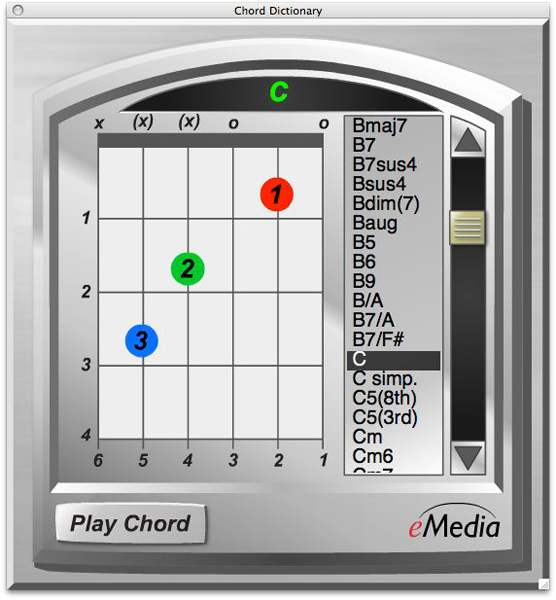 The eMedia Guitar Method CD normally sells for $59.95, making the discount an affordable $39.95. The upgrade can be picked up at eMedia’s upgrade website. Overall, I was quite impressed with the Guitar for Dummies CD. If you’re new to the guitar, it will certainly get you playing reasonably well in a fairly short period of time. I’d say that this is a great start for new players, but by no means replaces the advantages of having actual lessons from an experienced teacher. 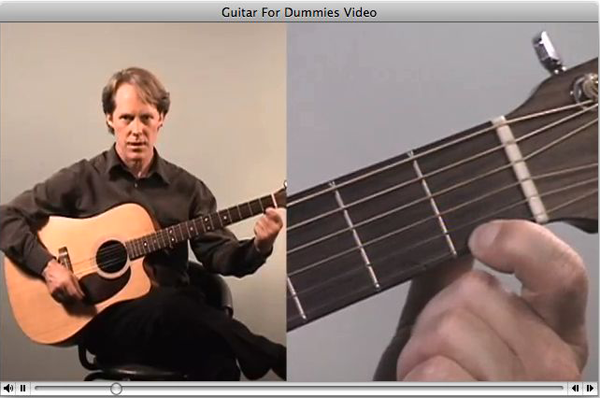 Considering that private lessons typically run $20.00 per half-hour session, the Guitar for Dummies CD is a much more economical way to decide whether playing the guitar is right for you.